Arguably the best part about summer is jumping in a pool on a hot day. There is no better feeling than swimming around, escaping the heat. But now that it is September, the heat is (slightly) less oppressive. But that does not mean you have to close down the pool for the season! Here are the best ways to heat your pool without breaking the bank. Summer might be coming to an end, but don’t close the pool just yet. Try out these cheap ways to heat your pool. There is nothing quite like swimming in a warm pool in autumn, when the summer heat has faded. But that comes at a price. 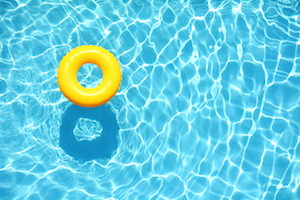 The average cost to heat a pool can range anywhere from $300 to $1,000 per month, depending on the size of the pool. Don’t stress though, there are plenty of ways to heat your pool for a lot less. Here are the seven cheapest ways to heat your pool this off-season. One of the most cost-effective methods for retaining heat in a swimming pool is a solar cover. The root cause of heat loss in a pool is evaporation. Heat rises, so the warm water rises to the top of the pool, and then evaporates into the air. This occurs most during the day, when the pool is exposed to the sun. A solar cover acts as a protective lid and is designed to absorb solar heat and reduce evaporation. The initial purchase rate can vary depending on the size of the pool, but the initial cost should not come anywhere near breaking the bank. Solar sun rings work in a similar way to solar covers. It really is personal preference whether you want to have one full cover to place on top of the entire pool, or multiple smaller rings that can be moved around. Just like solar covers, sun rings prevent evaporation and warm the pool through solar heat. Solar rings can be moved around on top of the pool. Additionally, it is easier to use solar rings to cover a pool rather than find a solar cover that fits the pool perfectly. Just like solar sun rings or solar cover, a liquid solar pool cover works to combat evaporation and therefore prevent heat loss. The liquid solar pool cover is a type of liquid that is poured into a pool that creates an invisible liquid barrier that sits on top of the water. This liquid layer reduces evaporation, which decreases heat loss. The liquid is perfectly safe to swim in, is biodegradable, and does not contain any harmful chemicals. However, these might not work if your pool is in a windy location, this might not be the most effective method, as the wind can break the liquid seal. A windproof pool enclosure is the best method to keep your pool warm if you live in a windy area. The wind alters the surface area of the pool which allows for warm water to escape from the pool. Wind proof enclosures protect against the wind, and therefore protect the pool from losing warmth. A bonus is that windproof pool enclosures make the pool accessible in any weather, rain or shine. The cost depends on the size of the pool and the materials used to build the enclosure. Although this method is slightly complicated, it works just as well to heat your pool without breaking the bank. This black hose trick uses solar energy in a simple but clever way to heat the pool. Purchase a black garden hose. Unravel the hose and connect it to the water tap outside your house. Then run the hose to a spot that gets direct sunlight, and wrap the house in coil formation in the direct sunlight. Run the remaining hose into the pool. The sun will heat the water as it flows from the house into the pool, and flow warm water into your pool! A pool heat pump is a valuable investment. Pool heat pumps draw in warm air from the atmosphere and use that air to heat the pool through a low energy process. This process harvests heat from the atmosphere and transfers that heat into the pool water. This method will heat the pool much faster than those mentioned before. Additionally, a pool heat pump relies entirely on temperature, and not the sun. Solar rays do not impact the effectiveness of a pool heat pump. Although this method might be slightly more expensive, this is the best way to heat your pool for less. Combine a solar cover or solar rings with a pool heat pump, and your pool will stay warm as long as you like. The pool pump covers the cloudy day and nights, while the solar heater covers the sunny days. With these two combined, you will have a warm pool for little cost! How do you heat your pool? Share with us on Facebook!